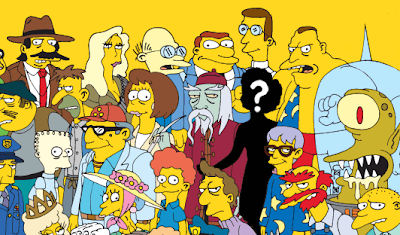 The Simpsons 20 Years Character Contest. "For 20 years, the artists and writers of THE SIMPSONS have lovingly labored to create a parade of hilariously memorable characters beloved by the whole world. Well, that's all over now. The simple fact is, we're tired. Tired and, frankly, too rich to care anymore. That's where YOU come in! While we coast on our long ago achievements, you have the chance to shame us off our lazy butts by designing your very own Simpsons character! (Come up with a great name and catchphrase, plus a brief description, and if you're selected as the winner, we'll bring you to Los Angeles to meet with an actual artist from THE SIMPSONS who will bring your character to life in the episode currently planned for January 31, 2010.) Come on, people, show us how it's supposed to be done. You'll have the satisfaction of creating a character seen by millions. And we'll have the satisfcation of not having to do our jobs."